It’s not just beds and mattresses that are bespoke made to order. 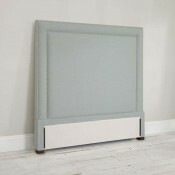 Forest Contract also manufactures headboards to cater for all styles and trends and offer a variety of designs. All of our commercial headboards are manufactured and produced in the UK using only the highest quality materials and often designed and specified by our customers to create a statement in the room, or a central focus point exaggerated by the use of quality fabrics or leather. Our headboards come in multiple sizes, ranging from singleto our largest size the emperor headboard, which measures at 7ft wide for the ultimate grand sleeping experience. 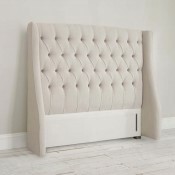 Contract headboards can be made floor standing, or wall hanging to suit the venue and room. 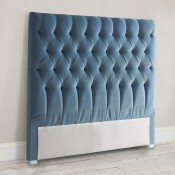 Our headboards also come in a variety of shapes included flared buttoned winged panels or clean plain, flat shapes, browse our range to find the perfect headboard for you hotel or guest house. Contact a member of the sales team if you are looking to have your own design bespoke manufactured. 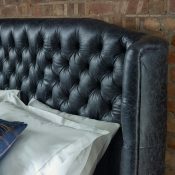 All of our contract headboards can be upholstered in your choice of leather or fabric and we offer a huge range of materials to choose from. 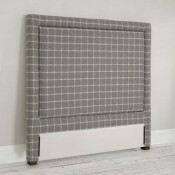 However, if you have sourced your own material, we will be more than happy to upholster the headboard, but we must be presented with a CRIB 5 compliance certificate before production begins. 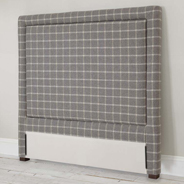 We offer a variety of headboards, from the more traditional style headboard with deep buttons as well as supporting wings, creating a very regal and elegant feature for the bedroom. There are more contemporary styles of headboards, which include simplistic fluted designs, and modern stitched detailing, all of which are perfect for hotels. If you require any assistance or information on any of our headboards, please do not hesitate to contact a member of our contract team who will be more than happy to answer any questions you may have. For information on past projects which involved Forest Contract supplying headboards, take a look at our case studies page which is full of examples concentrating on hotel furnishing, all containing images and information.